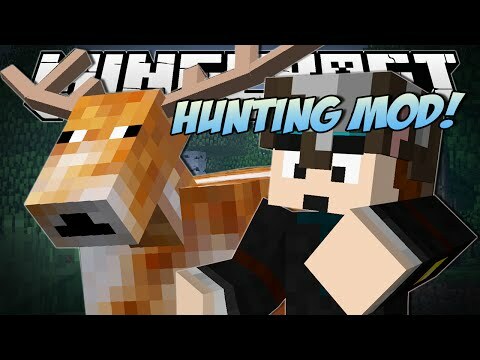 Welcome to ‘The Hunt’, a Minecraft mod based on hunting. This mod is still in early stages (alpha), and not all features are implemented yet. It is recommended to use the latest version of the mod, as more bugs will be fixed and more features present. Please note that the information below has been written for the most recent version of the mod, and therefore features below may be missing for earlier versions. 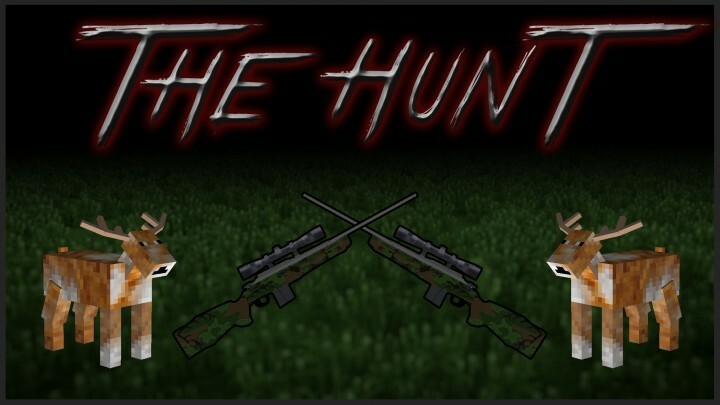 The Hunt offers a variety of 3D guns to allow the player to hunt down anything they desire, such as animals, monsters or even players. 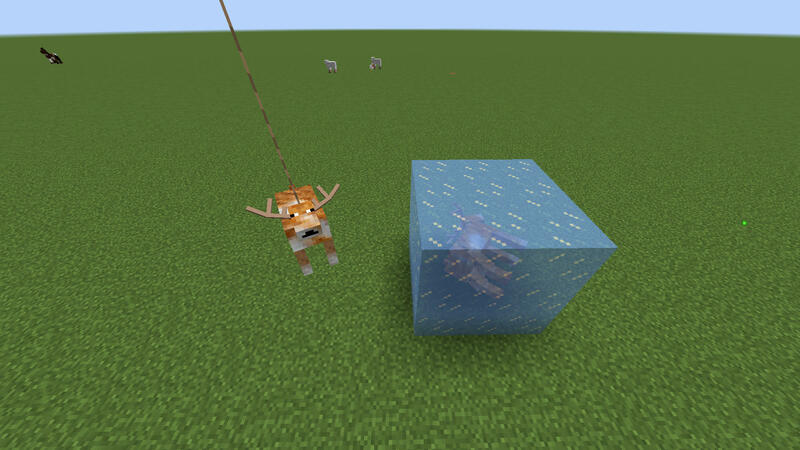 Survive the Minecraft world in a new way and increase food supplies by using the new deer mob. Trap blocks can be used to immobilise your prey, making them easier to shoot and catch and even poison them. Exploring the new biome will lead you to new structures and groups of deer. Deer will run from the player and are fast, so it’s best to choose the most suitable weapon for each situation. Structures can provide shelter when exploring and contain some loot, some chests are also hidden containing better loot. More information can be read below in the ‘Detailed Information’ section. Installing this mod is the same as installing a standard Minecraft mod. 1). Download and install Minecraft forge for 1.12.2 (files.minecraftforge.net) (built for forge version 14.23.4.2705). 2). Download and extract this mod, so that you have the jar file. 3). Drag the jar file into the mods folder of your Minecraft installation. (The mods folder can be found in ‘.minecraft’ after typing ‘%APPDATA%’ in Windows search. You may need to run forge at least once for it to appear or make the folder manually). There are two types of traps, a standard trap and a poisonous version. 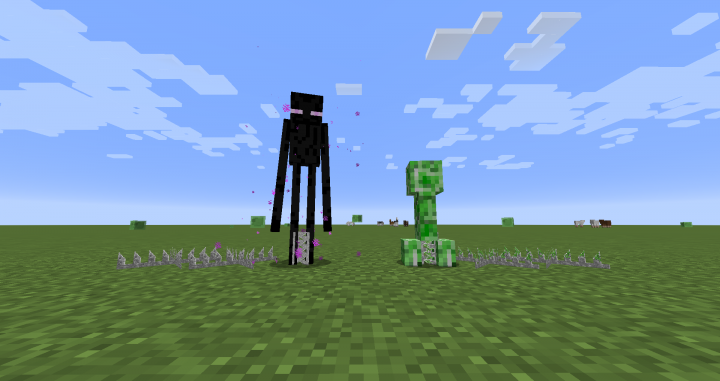 They clamp down mobs that walk on them, and the poisonous applies a poisonous II effect for six seconds. Players will become heavily slowed instead and vulnerable to their predator during this time. A trap can be reused once fired by destroying it with a pickaxe and armed by placing it back down. The hunting shotgun is a powerful close range weapon. It shoots nine pellets over a wide area as indicated by the custom crosshair shown above, allowing you to hit multiple mobs in one shot. Use the shotgun in either hand, or decimate mobs by dual wielding them. The shotgun uses two types of the shotgun shell ammo, default and incendiary. As the name suggests, incendiary will set your targets on fire. The pellets have limited range, and will do significantly less damage based on how far away the target is. The shotgun will also destroy glass, ice and melon / pumpkin blocks. This can make it a good tool for breaking ice and harvesting melons. The shotgun will need a reload after shooting four times, and this is indicated by the shells on the right side of the gun. The guns have a sprinting animation that changes when dual wielding. Use right click to fire when in one hand, or left click to shoot the left gun when dual wielding. These guns can be used along with other dual wield capable guns. To reload, right click when the item is fully damaged with the ammo in your inventory. Incendiary ammo will always be prioritised. The hunting rifle is a high damage weapon intended for long ranges. This weapon comes with a scope, providing vision across huge distances. Bullets do get affected by gravity, so you will need to aim above your target based on the range. The rifle can hold four bullets in its magazine before being empty. You can reload as long as you have at least one rifle round in your inventory. 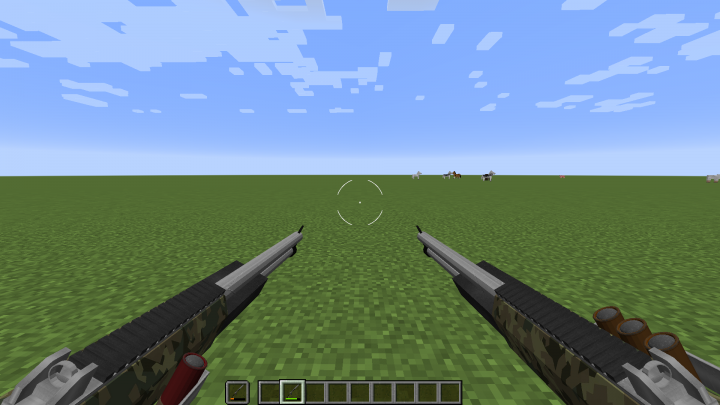 The rifle can use standard rifle rounds or the ender rifle rounds. 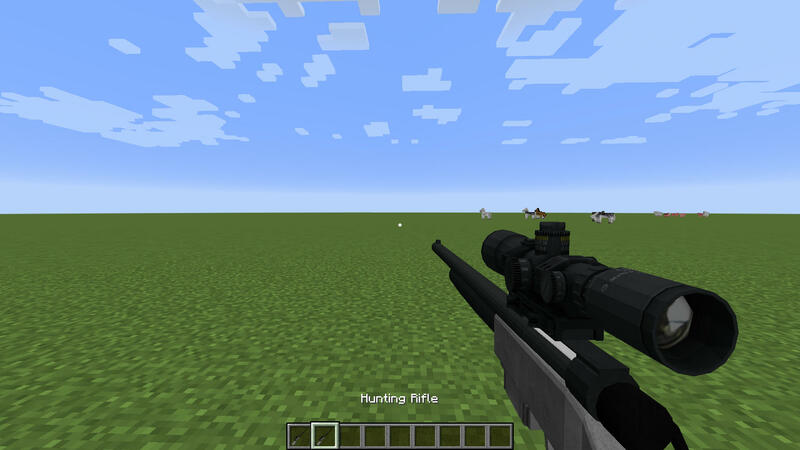 A standard rifle round can penetrate through mobs and breakable blocks (ice, glass etc. ), hitting up to four in one bullet. 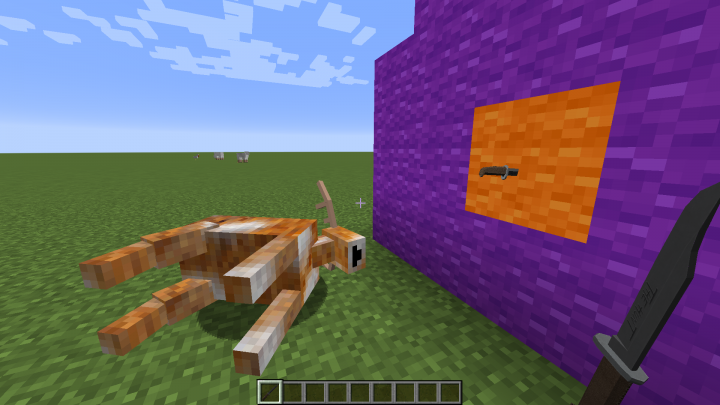 The ender rifle rounds will work similar to an ender pearl when shot at blocks, or can be used to kill Endermen. The hunting rifle adds weapon sway to the game. This can be reduced by using the scope, and you have the ability to hold your breath to further reduce this. When scoped, you will see a breath counter at the top of the screen. The sniper also has some animations. Hold right click to scope in, or release early to perform a ‘quick scope’. Use right click when out of ammo and with rifle rounds in the inventory to reload. The gun may only be used in the main hand, with the other hand empty. The hunting revolver is a somewhat powerful revolver for short to medium range. Holding right click will aim the revolver when in one hand. This gun can also be used in both hands, either with another revolver or shotgun. 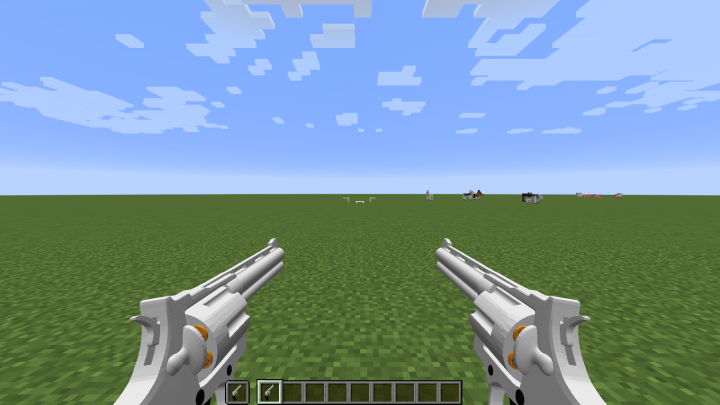 The revolver holds six bullets before reloading, and can penetrate up to two mobs and blocks. You will need revolver rounds in your inventory to reload, and this gun includes reload animations. Use this gun like you would for the hunting rifle. This is an item that cannot be crafted, you need to find it in dungeon chests, mineshaft chests, the bonus chest or the world generated cabin spawned in the "Hunt" biome. This acts as a fast small sword and can also be thrown. Throwing the knife will cause it to stick in the wall if it is a soft block (dirt, wood, sand etc. ), or bounce off if it is hard (stone, hardened clay). The knife will also bounce off mobs, allowing you to pick it back up. Throwing the knife causes damage to it, which can be repaired in the anvil with iron. It is made to be used on a dead deer, allowing you to obtain more venison from it. It also is a component in crafting the venison jerky. The deer is a new mob that will not harm you. Deer do not like player’s presence and will try to run away to avoid being killed. They have a wide range eyesight so will see you easily. They spawn in forests and the ‘Hunt’ biomes. Upon death, they will fall to the ground leaving the body behind. Killing the dead deer will give you venison which can be eaten or better cooked in the furnace. Using a hunting knife on a dead deer will give you more venison. All bullets are affected by gravity, and can destroy blocks such as glass, ice and gourd. The revolver bullets will penetrate up to two mobs, while the sniper does four. Bullets also have a chance to ricochet off hard blocks like stone. Be careful when shooting as they can bounce off and hit for some serious damage! The Hunt biome contains custom large trees and is full of tall grass and plants for the deer to hide in. Many different types of animals will spawn here, as well as custom structures as shown above. Hunting towers provide a way for the player to see where they are since all the foliage can disorientate the player. Large and rarer cabins provide shelter for the night, or can be made into the main base. They contain food, resources and a hidden chest. The configuration file can be found in the standard config file inside your Minecraft directory. In this file, you have the ability to change the weapon damage, turn off structure generation, disable the biome, and adjust ricochet and bullet penetration options. This mod is at the stage where it should be working on a Minecraft Forge server. The server hasn’t had much testing so if you do find any bugs, please do let me know below. Some third person animations have been disabled for now on the sever to get it to a working state. As mentioned, this mod still has a lot of features that are currently not implemented. However, I can’t promise these will get added soon. If you have any ideas or improvements, please comment them below. All ideas, feedback and help are welcomed. I will try to keep this mod up to date for the latest Minecraft versions. Since I don’t play the game these days, I’m not sure which are the most popular versions for modding. At this point, I don’t think there will be any versions in between 1.7.10 and 1.12.2. You have my permission if you would like to create a mod review featuring this mod, as long as you provide appropriate credit. This can be done by saying who it is made by and leaving a link in the description to either this page or my website (http://arkif.webs.com/downloads). Feel free to leave your review link in the comments below. Please ask for my permission to use this in a modpack that you are creating. Ask me either in the comments below or private message me here. I will most likely say yes so don't worry, but please provide a link to the modpack if or when published. By downloading this mod, you agree to the EULA. By downloading and/or using ‘The Hunt’ ("Mod"), you hereby permit the Mod and any software which has a hard dependency ("Child Mods") on the Mod to use your internet connection to request non-malicious information/content from third-party sources such as Github.com. You accept that the Mod is provided without warranty; software support will be given where possible. You will also not hold Arkif ("Author") and other official contributors liable for any damage or harm caused to your machinery, self or any objects/biological beings around you. Contributions by the official contributors will be thoroughly screened/managed by the Author to ensure it is working as intended by the Author without any malicious intent. If any damage or harm has indeed been pinpointed to the Mod as the cause, this is completely unintentional and the issue in the Mod will be fixed/resolved as soon as possible. You understand that any downloads of the Mod not originating from arkif.webs.com ("Website") leading to the Website's File Host, MediaFire, may be modified without knowledge of the Author and may be malicious, and will not hold the Author responsible. In the event that any downloads originating from the Website are indeed malicious, it is entirely unintentional and will be rectified once the Author has been notified. You accept that if you are redistributing the Mod to other users without their agreement of this EULA and they were to use the Mod, you therefore hold yourself accountable for any conflict or problem that occurs and will be held responsible. This includes but is not limited to any of the other users disagreeing to any data collection done by the Mod. You accept that the EULA may change at any time without prior notice. However, the EULA will never change to allow The Mod and Author to intentionally introduce malicious content to your system. Currently, there are some lighting issues with the guns, but they are mostly minor and should not crash your game and damage your worlds. If you do find another bug, please let me know in the comments below or private message me here. Download the latest version at the top of the page. 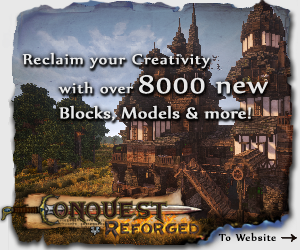 Please do not download the mod from anywhere else but here and curseforge as it may be infected with malware. Can their be an AK gun as well. People hunt with those too. Hey! I'm trying to make a new modpack, could I add this mod to it? Please, a recipe for crafting the hunting knife? This mod is great, a suggestion would be head mounts or just regular mounts. Also decoys and hunting blinds and deer stands would be nice. Maybe trails the animals walk on with tracks on them. Deer hunting is more of stationary hunting than moving around. Also other animals like turkey, hog, birds, etc. Thanks for your time. Hey um Im gonna be using this for a mod pack at some point are you cool with that? Do you know this error? [21:10:15] [Server thread/WARN] [Minecraft/]: Wrong location for EntityHitArea['Hit Area'/122080, l='world', x=49.50, y=58.27, z=198.50] in world 'world'! [21:10:15] [Server thread/WARN] [Minecraft/]: Cauldron has removed EntityHitArea['Hit Area'/122080, l='world', x=49.50, y=58.27, z=198.50] to prevent a server crash. Haven't seen this one before, what was you doing at the time? I'm not sure, I think plugins or server problems. Quick idea: Add a treestand, and a "stand alone" stand. Haha, thank you! :D Glad to hear that you like the mod, and thanks for the suggestions. Thanks for the motivation! Just updated, sorry for the wait. What's the "level-type" to get The Hunt world generation on a server ? I lost some of the code for the biome so I am not sure as of right now ):. You can try the latest version as the biome will spawn in the default if you like. Is this mod still active? Because I want to be the first to review v.03 on my channel, seeing as I did the other versions! Yes, working on the new update now that I have published my third mod. I'll try to get it out soon for you and thanks for the reviews! and maby a .44 magnum revolver that fires fast to kill a bear if it attacks you or zombies and creepers and what ever else attacks you. Thanks for the idea, I need to update this mod because there are a lot of suggestions I need to add in. I suppose if it is open source (I'm not sure if it is) but at the same time I don't want to copy someone's work. I may be able to adapt from it though and find a way in the future. Could you make the rifle shoot a bit farther please? It's a little bit unrealistic right now, but pretty close to a good range. Also, how do you obtain the cow leather hat, is it just a normal leather cap? And some camping gear would be great too. It's still a great mod right now though, great work! The reason for the rifle range being lower than usual is because I didn't want it to be overpowered and make the other weapons redundant in pvp. For example, you could be shooting players from very far away and they will die instantly if they don't have armor. Obviously this can be annoying so I added a gravity element which will make it harder to hit the targets. There is no cow leather hat in this mod. Yes, I could do this - thanks for the idea. I will be looking into camping gear as well. Yeah sorry, I was mistaken about the hat. It's in CustomNPCs but TheDiamondMinecart uses it in his review so I was confused. https://www.youtube.com/watch?v=U6wynaoYaIw i made a mod showcase from italian country :D!!!! Thanks, I will be updating this mod after I release my next (: Thanks for the inspiration and your English is good! I CANT EVAN GET THE MOD!!!!!!!!! What is causing the problem? Is the download not working or something else? I really love this mod. And I love the details in the guns! The running animation is epic, BTW. Anytime, Keep up the good work! Can you please add a config file to configurate the damage of guns? Awesome mod! Can't wait to see how this plays out! 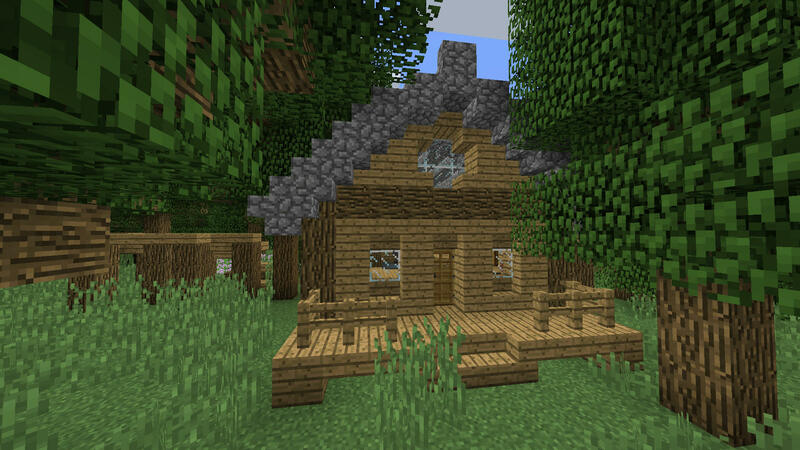 I would like to use this mod in a modpack, but I was just wondering if you can give me permission to put this in the modpack? Yes you may use this in your modpack.